Every family has a secret, but Uncle Max’s could wreak havoc on the world. Dr. Bruce Starkman, chief ER resident at Chicago’s Cook County Hospital, is plucked from total immersion in his profession by the mysterious death of his Uncle Max. It’s only when Bruce finds his uncle’s hidden journal detailing Max’s ordeal some fifty years before in Theresienstadt concentration camp that the situation begins to make sense. Deciphering clues his uncle left behind, he has to decide whether to seek the truth about something from the past, or move forward with his medical career. The young physician soon realizes a worldwide Nazi resurgence is imminent unless he can find and destroy a secret document written by Nazi leaders and concealed in a silver box, which his uncle hid in 1945. This forces Bruce to reevaluate his priorities and start his own search for the elusive box. The search takes Bruce and Miriam, an aggressive, attractive Israeli woman with military training to Paris and the Czech Republic, while being pursued and attacked by groups of vicious neo-Nazis. Can Bruce cross over from a healer to a person of violence? The world’s future may depend on it. 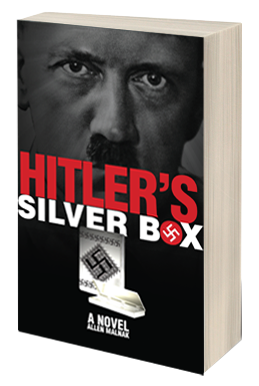 Written with an eye for detail and a dramatic sense of timing, Allen Malnak’s Hitler’s Silver Box is the kind of story that grabs its readers by the collar and tells them to hold on tight.